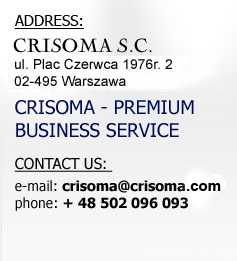 Welcome to CRISOMA web site, the best place to purchase high quality products from Poland. We offer you competitive and fair prices, fast deliveries, wide range of products and much more, depending on customer’s needs. We offer your best Polish glassware, machine and hand made. Our brand is well known across Europe. Whatever you’re looking for: tableware, floristic vases, promotion glass or high-end luxury glass products, we have them all!